Low and high scores were determined by the 10th/90th percentile cutpoints (as appropriate). Source: CICH Graphic created using data adapted from the Survey of Young Canadians 2010/2011, Statistics Canada – custom runs. 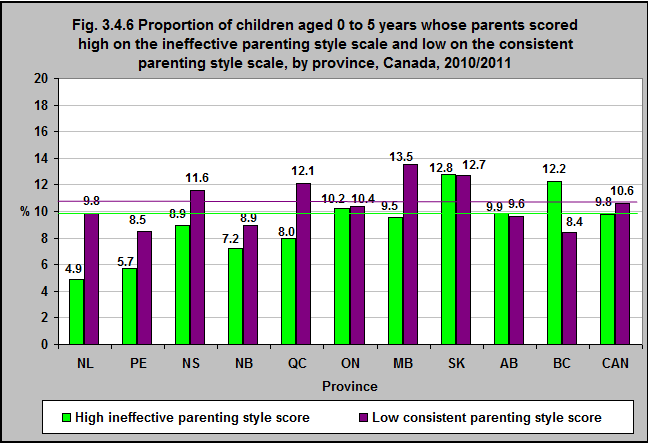 In Canada in 2010/11, almost 10% of children aged 0 to 5 years lived with parents who demonstrated ineffective parenting* styles. That proportion varied by province – with a high of almost 13% in Saskatchewan and a low of about 5% in Newfoundland & Labrador. In that same year 11% of 0 to 5 year olds lived with parents who were not consistent** in their parenting styles. That was the case for 14% of young children in Manitoba and 8% in British Columbia. *The National Longitudinal Survey of Children and Youth (NLSCY) and Survey of Young Children (SYC) measure family functioning by looking at how well a family works together – for example, how they solve problems, communicate, treat each other emotionally and assume their various roles.